The story begins in a slum, where young Mangal (Master Ravi) is trying desperately to earn some money to buy bread for his dying mother. He is too small for the work available, and finally in desperation tries to steal some bread from a restaurant. He’s caught, but a rich patron takes charge of him, pays for his bread and takes him home. Alas, it’s too late: his mother has died. This experience takes root as an obsession for Mangal: roti. It’s an obsession for which he will pay, over and over. The benevolent customer naturally has an ulterior motive. 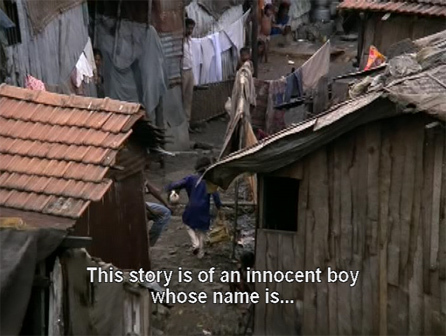 And so Mangal begins a life of crime, brought up and taught to steal by Suraj (Pinchoo Kapoor). He grows up to be a dashing young man (Rajesh Khanna). We meet him as he’s fleeing by motorbike from the police. He is saved when a truck’s rear door is lowered, enabling him to drive up into it and away. Inside the truck Suraj awaits in his mod mobile lair. 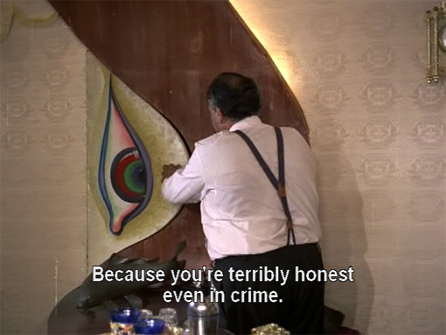 Mangal, though obviously a criminal, does appear to have principles. He wants to quit the crime business and open an “eatery” where everybody—rich or poor—can eat together. Suraj has other ideas though; his plan is for Mangal to inherit his business and keep it running. Mangal refuses his offer of dinner, saying that his stomach prefers the simplicity of bread. At the roti seller’s stand, though, a man (Shyam Kumar) comes up and snatches away Mangal’s roti. They argue, and decide to fight for it. Cue the Sergio Leone music. A bread duel! In fact, it is actually quite disturbing—it’s so primitive and raw, these fisticuffs over a hand-sized roti. Man reduced to his base self, fighting out of pride and not hunger. 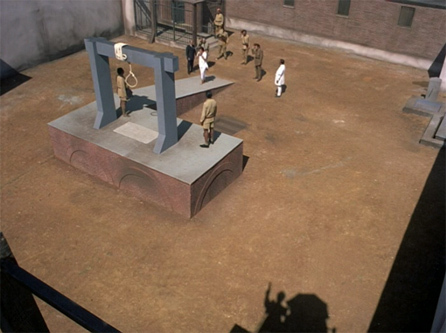 It ends when Mangal accidentally stabs his opponent, killing him, and the police arrive and arrest him. In jail, Mangal has been granted his last request before he is hanged. The next frame causes me to fall over laughing. He puts one roti in his pocket for “upar” and walks towards his fate. Oops. Looks like a cameraman or two are projecting their shadows into the yard. Anyway, as you might expect, it’s not Mangal’s day to die. 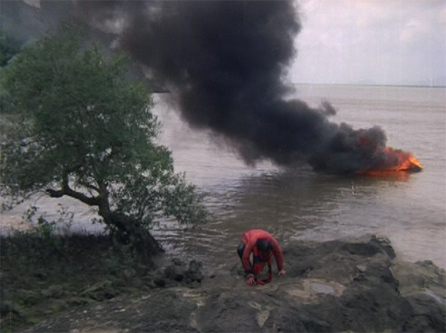 Suraj sends a helicopter to rescue him—but after a chase during which the police shoot the pilot dead, the helicopter crashes. Luckily, Mangal escapes before the police arrive on the scene, and they assume that he’s been killed. He gets on a train and follows the smell of roti to a compartment. Its occupant is a nice young man (Vijay Arora) who offers to share his food with Mangal. They are having a nice chat and eating, when the young man notices Mangal’s handcuffs, still hanging on his wrists. 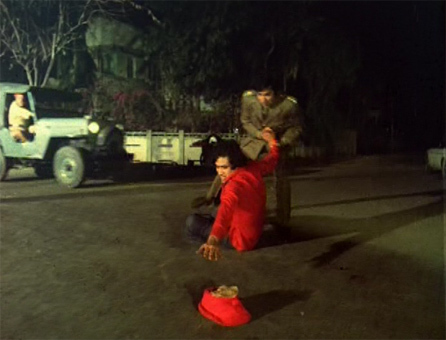 When he tries to pull the emergency chain, Mangal stops him and they scuffle. The fight ends with the young man falling off the train into a river they are crossing on a high bridge. Appalled, Mangal himself jumps off the train on the other side, and finds his way to a blacksmith’s. The blacksmith’s young son cuts the cuffs off and Mangal continues on his way, hopping from bus to bus. In one town there is a big commotion going on. A young woman is being stoned by the local men for being a dancer, and having loose morals. He goes to her rescue with a song whose lyrics come straight out of the Bible (“Yaar Hamari Baat Suno”). Chastened, the men slink away and Mangal continues his journey. 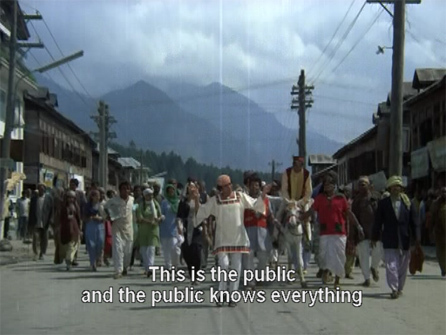 The scenery is spectacular, I might add; the movie was shot mostly in Kashmir and it’s beautiful. He ends up in a small town where he meets a feisty young woman named Bijlee (Mumtaz) when he tries to steal some bread from her small restaurant. 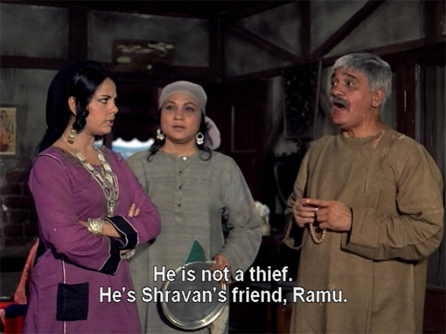 He also meets a blind couple (Om Prakash and Nirupa Roy), who mistake him for a friend of their son’s and take him in. They are expecting Shravan to arrive shortly to take up a job as schoolteacher in the local school. The police have been called to investigate the disappearance of the passenger from the train. They find the missing man’s papers and his luggage on the train. Nooo! There is no sign of a body, though. When they identify Mangal’s fingerprints at the scene, they realize that he isn’t dead after all. The police surmise (correctly) that the missing passenger must have recognized him, and that Mangal killed him to keep him quiet. 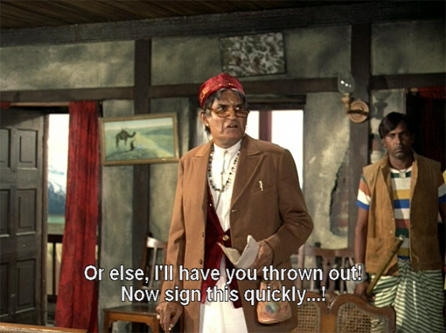 Meanwhile, Mangal takes on a local moneylender (Jeevan) and his thugs who are trying to browbeat Shravan’s parents into giving up their house. He wants to build a hotel on the site. Mangal kicks them out, endearing himself further to the old couple and enchanting Bijlee, who takes care of them in her spare time. Jeetendra makes a special appearance as himself during the song too! Bijlee has been chasing after Mangal for some days, and wins him over with yet another lovely song, “Gore Rang Pe.” Rajesh Khanna and Mumtaz have such great chemistry, it’s no wonder they were such a hit pair. Mangal is happy for the first time in his life. He’s finally going straight, has found parents and the love of his life, and is helping people rather than stealing from them. 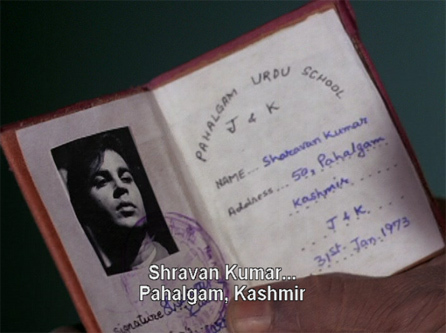 When Shravan fails to appear, he reluctantly takes the teaching job as well (his own education was somewhat lacking; his answer to “Who was Akbar?” is “Prithviraj Kapoor!”). But the police are tracking him doggedly, and they also come to town to tell Shravan’s parents that their son is dead. Mangal’s former employer Suraj is closing in on him too—he wants revenge because Mangal did not return to him after escaping the noose. Bijlee’s nephew comes to stay with her, and he is that same blacksmith’s son who cut off Mangal’s handcuffs. I will tell you this: there are some pretty grim moments in this story. It’s compelling! Mumtaz is delicious as the fierce beedi-smoking Bijlee, and as I’ve said already Rajesh Khanna is superb as ill-fated Mangal. 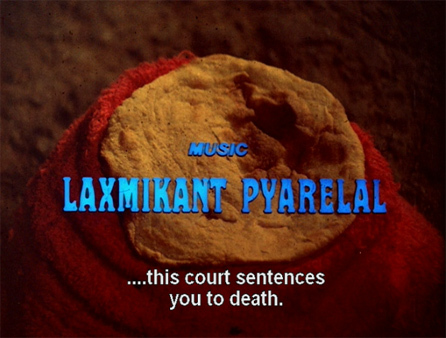 The songs by Laxmikant Pyarelal are wonderful, and the supporting cast is impressive too. But the mix of masala craziness and overwhelming sadness didn’t always work for me. I wish there had been more care taken with the script: fewer plot holes and a more cohesive story. 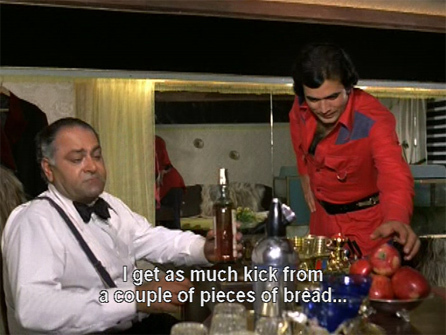 I do recommend the film, though, especially if you are a Manmohan Desai fan. I’d love to hear what other people think of it! Posted on July 5, 2008 at 4:25 pm in Hindi movies	| RSS feed You can skip to the end and leave a reply. Jeetendra made a special appearance as a star in the superstar’s movie!!!! And there is Vijay Arora, too. 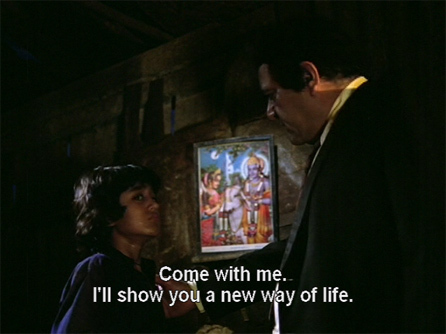 The movie sounds super-fun but its awfully hard to endure Rajesh Khanna at the zenith of his super stardom. Everytime he inclines his head in the famous Rajesh Khanna-style I am reminded of Sanjay Kapoor’s head-inclining trick in the song Aati nahin (she doesnt come, the movie was Prem) and the constipation jokes it provoked! Bollyviewer—thank you for reminding me that I didn’t give Vijay Arora credit in my post (I’ve fixed it). The movie is not fun; it is quite sad, actually. I haven’t watched a whole lot of Rajesh Khanna—have never really understood his appeal, to be honest; but he was really good in this. Truthfully, I haven’t been able to stop thinking about the film since I saw it, and I don’t think this post does it any justice at all. I’ll need to watch it again, for sure. “Oops. 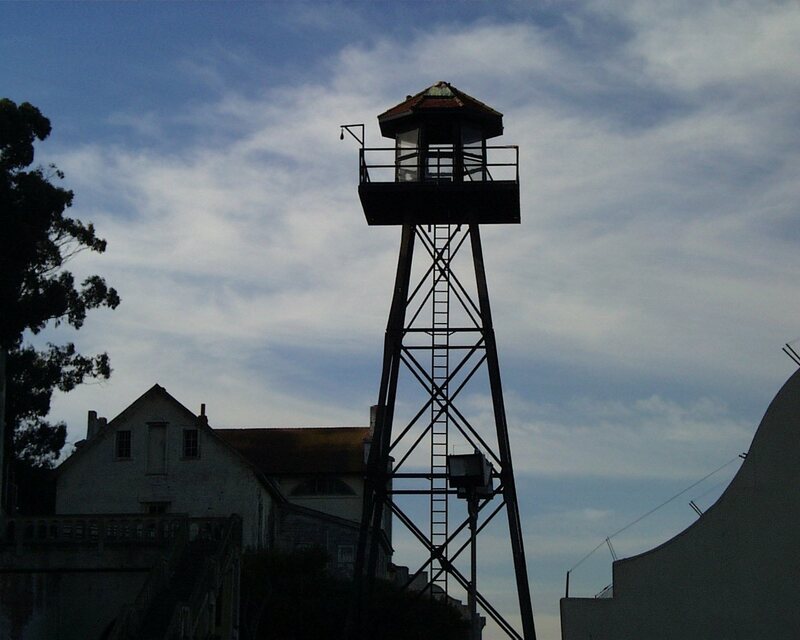 Looks like a cameraman or two are projecting their shadows into the yard.” – The makers could lie and say it’s a guard on duty in the watchtower. Haha! I started LOLing at all this breadness. As a Manmohan Desai fan, I’m keen to see this, but I – like BV – am not sure if I can handle a lot of Rajesh Khanna. Ajnabi: Yes, probably should have some bread on hand when watching this. It’s not a bad film, and it isn’t mindless either…I think my review maybe sells it short on that front (I tend to focus on the silly just because…I’m shallow and silly myself?). I think it could have been really great with a few adjustments. I did not get bored, and I found myself very emotionally entangled with all the characters, including the police inspector (Sujit Kumar, and he was really good) on Mangal’s trail. Madhu: I loved Mumtaz in this, and they were very cute together. I’ve seen some other films with them as the lead pair (although not Dushman, I’ll look for it!) 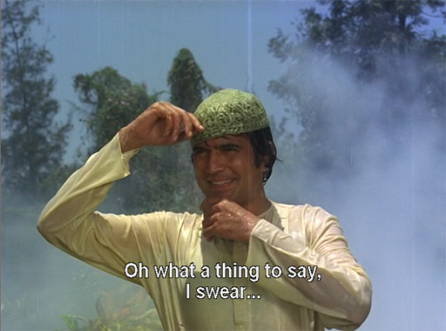 which I enjoyed too…Rajesh Khanna has never been on of my favorites either, but he is kind of growing on me. ppcc: I would do a watchalong with you on this one. I need to see it again, and I would love to hear your take on it. OHHHH vijay arora i fell in love with him the day i watched this movie and yaadon ki baraat, and everybody should love ROTI like Manoj kumar and rajesh khanna! 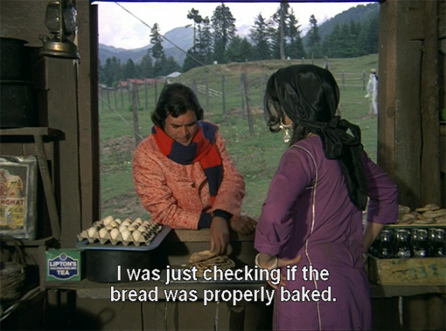 mumtaz and rajesh had such electric chemistry, and remember to eat your roti, memsaab! I eat far too much roti, Rum my dear :-) And Vijay Arora IS such a cutie pie. I love roti! Did Bijlee really say she wished she could feast on Mangal? LOL I am a fan of Manmohan Desai’s films, so I will definitely look out for this one. Shravan kumar is BTW the most dutiful son in the hindu mythology. His parents are also blind like in the movie. he gets shot with an arrow from Dashratha (rama’s father in Ramayana) as he goes to fetch water for his parents. The parents curse Dashratha afterwards the he may also die pining for his lost son. I don’t think that this last part is also portrayed in the movie. Thanks Harvey! That’s the kind of background thing that I very often miss, although I am trying to read the Mahabharata (and have read Ramayana). 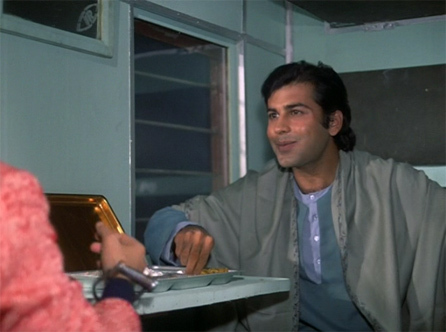 The rotis in the movie do not look sukhi or poor at all.They reminds me of the butter naan available at Delhi Darbar at Bhindi Bazar in Mumbai.Love the thrills and smart dialogues.Rajesh Khanna was awesome throughout.My favourite movie. 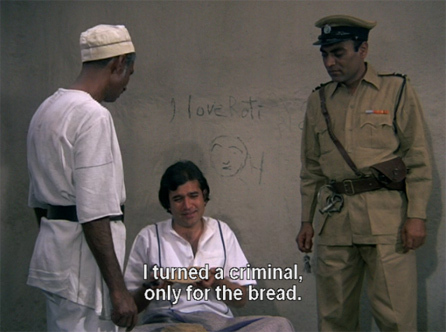 A movie which never fails to bore me.I find the scene in the starting where Rajesh Khanna fights and murders for a Roti very exciting.It also marks the beginning of Manmohan Desai’s masala entertainers. Sadly,Rajesh Khanna’s very last hit as a superstar in 1974.
can someone Translate the song ” Gore rang pe” in English?????? 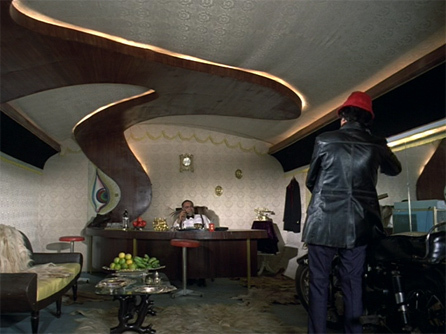 This movie is so satisfying–like a large plate of French/Belgian fries with lots of ketchup. I just loved our beedi smoking Mumtaz in her tight firans (spelling??) and the super star in his red tweed jacket or whatever you call it. One of my favorite scenes is when RK, ever the chauvinist, tells her to stop smoking, it’s shameless, and her repartee is that it is shameless to steal. I didn’t really like the songs till I saw the movie. Still think RK has great songs elsewhere but these songs here are great in the context of this movie. The ending dragged on for a good 40 mins at least and at every turn I thought we were done. Perhaps I still don’t have the stamina for authentic Bolly masala fare. The date 31 Jan 1973 on Shravan ‘s passport could may be be first shot of this movie to be canned. If anyone could, please help me. THanks a lot. I think this movie is thought provoking. You could try asking Atul over at his blog :) Or if you are lucky someone will catch this and do it for you. I love the songs from this, and the film is very thought-provoking, I agree! Who is the woman threatened with stoning in this song “yaar hamari baat suno” ? Is it Praveen Paul ? And I thank Raja for his translation. That gives me a reason to post this song with translation in my blog. No, although she looks a bit like her :) I don’t know who she is though. This is a great song, all the songs in this film are…they are subtitled on my dvd of it too which is a great bonus! Are the below translation correct? I felt like only partially correct. Sorry again. I am trying to put subtitle on the video. If anyone could translate it line by line? Thanks in advance. and Thanks for memsaab for such a wonderful site. I have uploaded the clip of Yaar Hamaari baat suno, and I added the subtitles according to the translation that squarecutatul provided to me. I did change a little bit just to present the theme of the story clearly. Do not hesitate to drop me feedbacks. Lots of thanks you all. It’s very nicely done Andy, thanks :) Beautiful song with wonderful lyrics and message! I have seen the movie mainly on television would love to watch it in a theatre on the big screen. 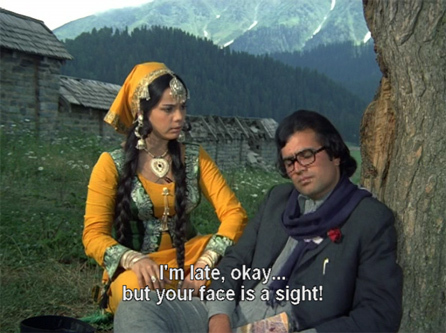 My favourite Rajesh Khanna-Mumu flick. I cried when his mother dies at the beginning and wept buckets at the end, both times I saw this movie. Prem Kahani is another of my favourite movies. Not a typical manmohan desai film if you have watched some of his later films with amitabh. This film had a fairly good script, rajesh was very good & his chemistry with mumtaz was crackling. The climax fight could have been better but probably the only MD film where the hero & the heroine both die in the end. Jai ho Manmohan Desai. So much is right about this film. The Khanna/Mumtaz jodi, a powerful narrative, a strong director and a dark climax help overlook a lot of the silliness which otherwise spoils the film. But what this film really stands out for, is its soundtrack. With Laxmikant Pyarelal and a zabardast Kishore and Lata playback, very little can go wrong. For me, every song, but in particular ‘gore rang pe’ will remain immortal. Roti was very entertaining. Those days Rajesh Khanna was a superstar and he was OK in this one. 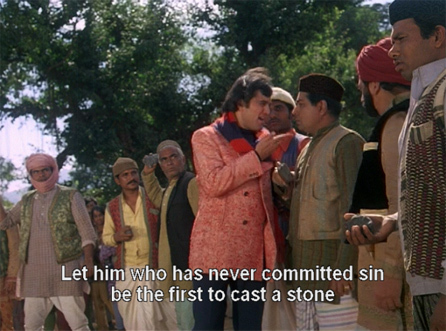 I remember Shatrughan Sinha also gained popularity as a villian and many heroes refused to work with him and in Roti the role plated by Vijay Arora was offered to Shatru. Hello Memsaab! How I miss your writing. We shall devour old films together yet as you knit and chuckle while having masala chai :-) as I implore you to put pen to paper! Regarding this film, I remember we’d tried to identify the actress that Kaka defends in the ‘Yaar hamari baat suno” and “Naach meri bulbul” songs who also was a pretty key player. As often happens, death brings the answer :-( She was Anita Sinha according to this piece below. Passed away a few days back. Veteran actress Anita Sinha, who is remembered for her role alongside Rajesh Khanna, passed away earlier today. 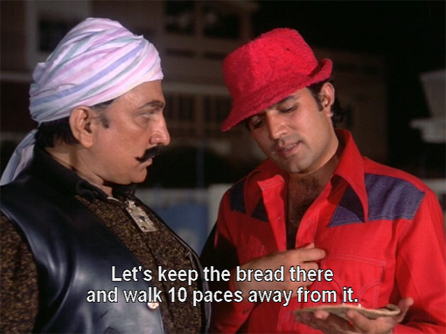 The two worked in Manmohan Desai’s 1974 directorial Roti. She started her career as a junior artiste and later she also worked in many films as a body double for other popular actresses. The late actress breathed her last in a suburban hospital in Siddharth Nagar. However, her neighbours said that she was healthy and fit until the end. The people around her addressed her as ‘Mata Ji‘. Her mortal remains will be taken to Motilaal Nagar later this afternoon.